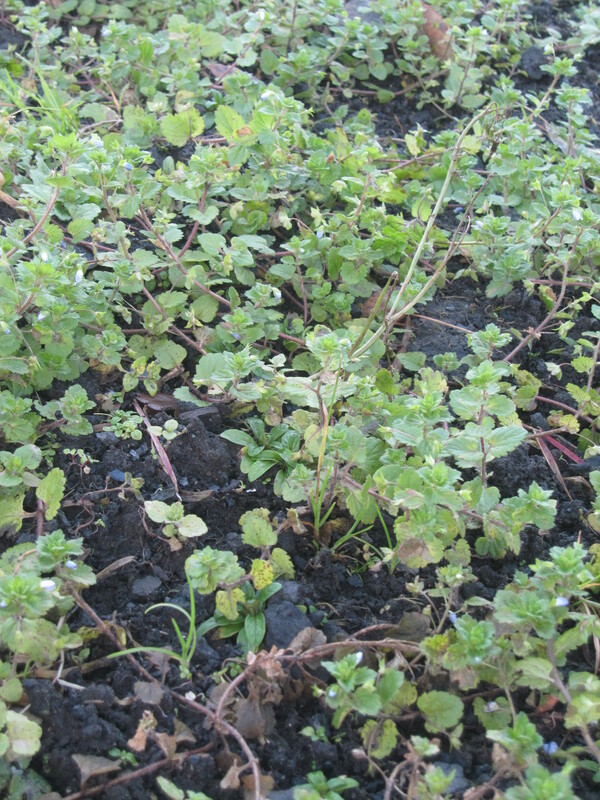 The most abundant and fastest growing weed on my allotment plot is this plant, the Speedwell Veronica persica. Only first recorded growing wild in Britain in 1826, it’s an extremely widespread and successful plant. 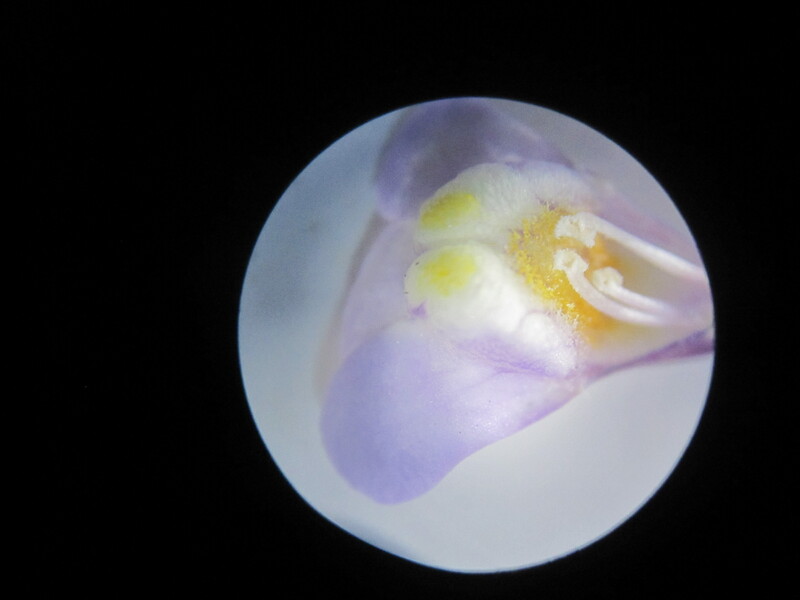 Of the Figwort family(Scrophulariaceae), the Veronica genus is the only one to have 2 stamens and 4 corolla lobes. 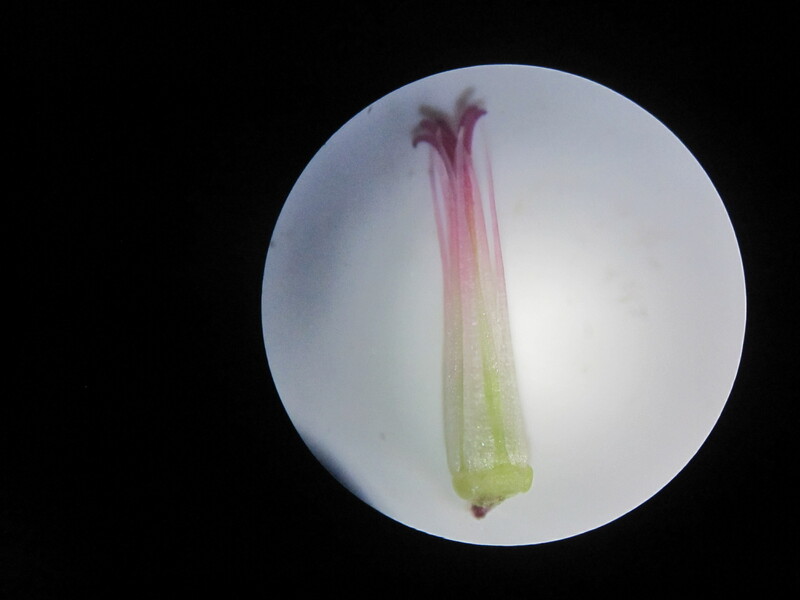 The above photo shows the 2 stamens of V persica. One of the diagnostic features of V persica in comparison with V polita and V agrestis is the larger size of the corolla of V persica. At this time of year its difficult to find the flowers and they tend to be closed and inconspicuous. 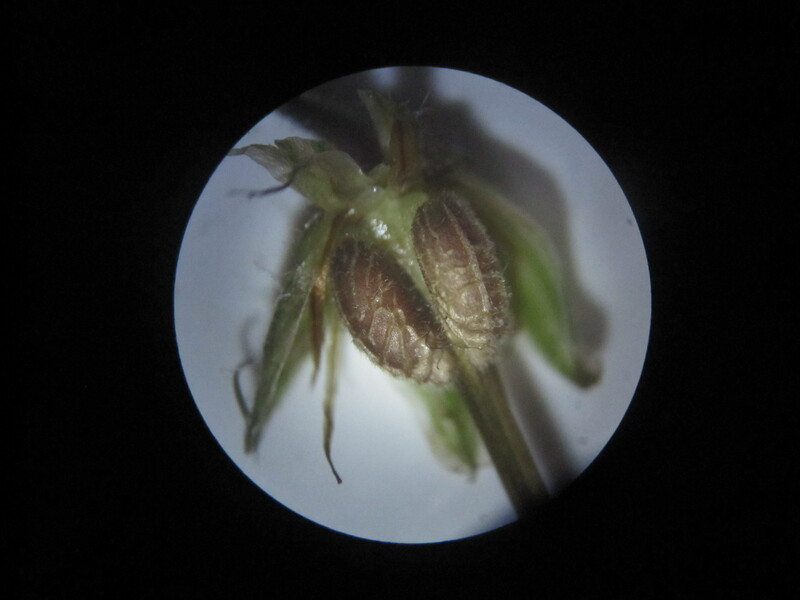 Another important feature is the shape of the seed capsules which with V persica are held at an angle away from each other as this photo shows. 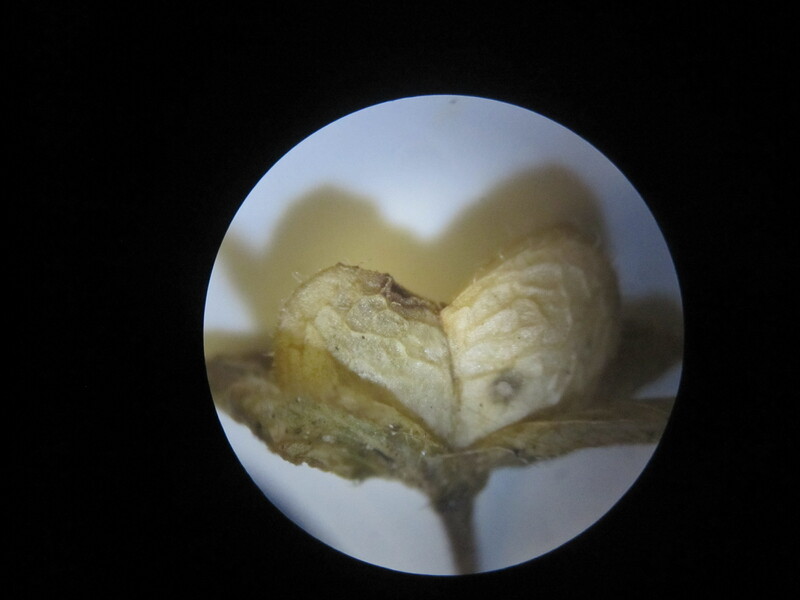 However if you look at the sketch in the first photo, the shape is not present when the seed capsule is not yet ripe. Although not a diagnostic feature it is noticeable how the seeds are held on long pedicels (flower stalks)outside of the line of the leaves. 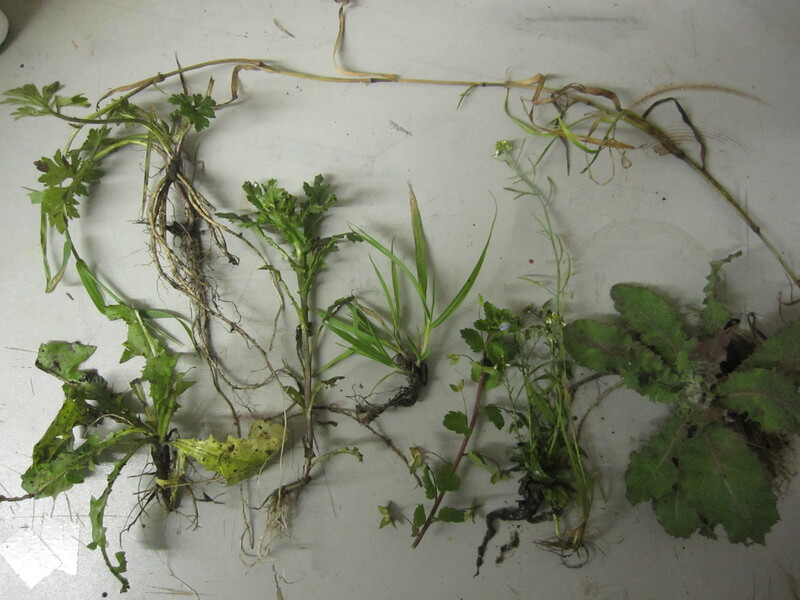 Three months growth of V persica on previously bare ground. For me this is quite difficult territory, the world of the Fabaceae or what used to be called the Leguminosae. This family include the peas, so if you know what a pea looks like you should be able to tell if the plant is in the Fabaceae. Rose (2006) has a useful diagram on page 266 labelling the various parts of the pea flower. The top most petal which often stands erect is the standard. 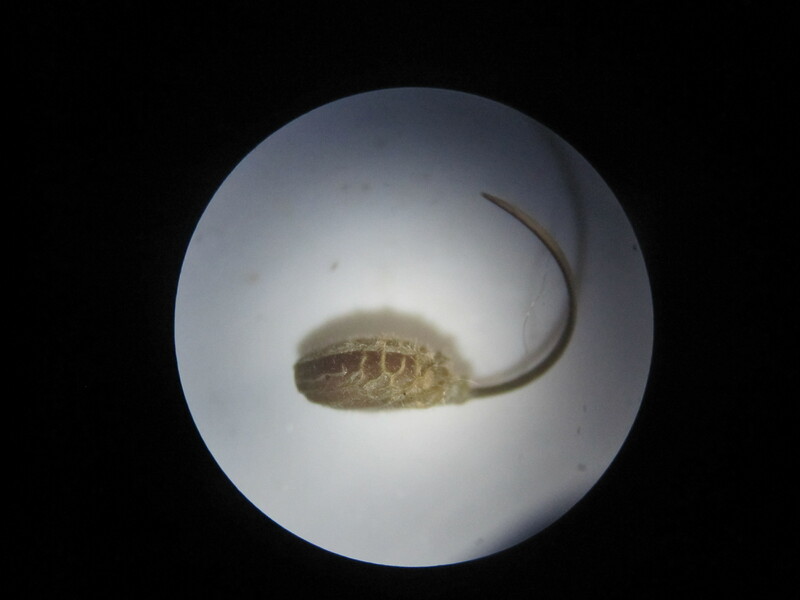 Immediately beneath it are 2 wing petals and at the bottom are 2 petals fused together into one called the keel. 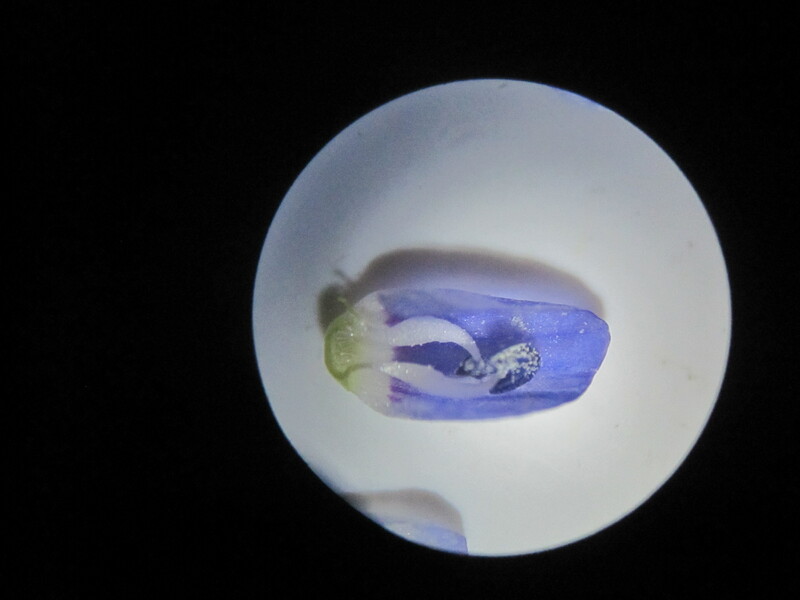 This photo shows the keel petal to the right, all the other petals have been removed. Note how well it hides the stigma and stamens. 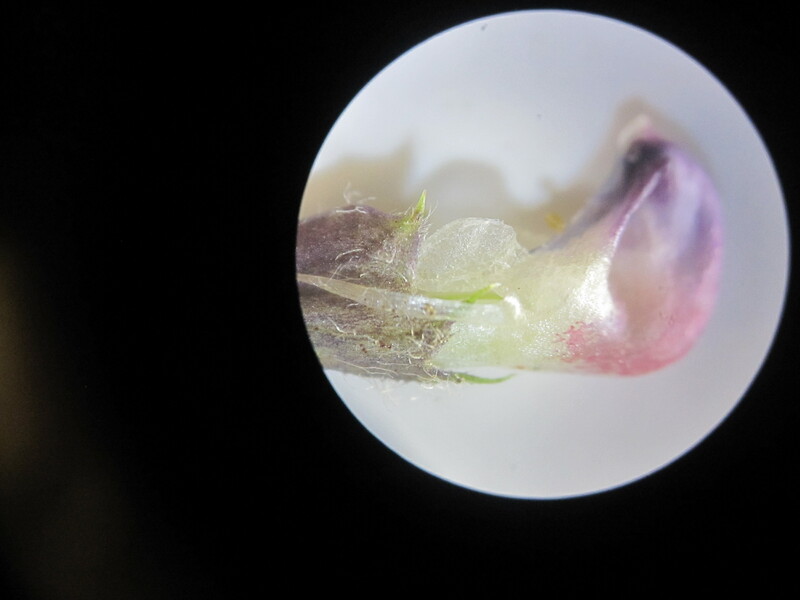 On the left is the calyx which forms a tube with teeth, these teeth are longer at the bottom of the flower, and this is one of the diagnostic features that separates V sepium from V sativa. ( the latter has more even teeth length). Concealed by the keel petals are the stamens (10) and style (1). The stamens are joined to form a tube. So there are lots of use of the words; usually and generally. 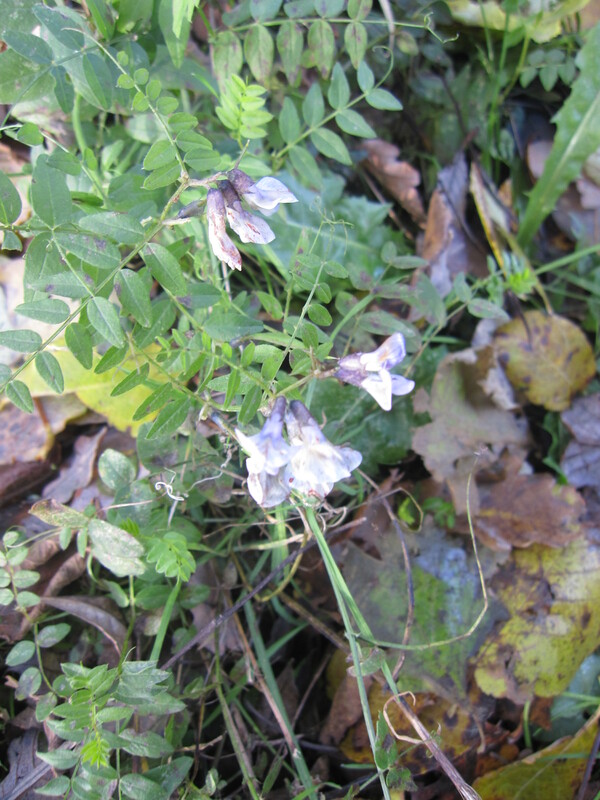 Calyx teeth length is the feature used to differentiate the 2 species in Streeter (2010), so all in all, I think this is Bush Vetch Vicia sepium. 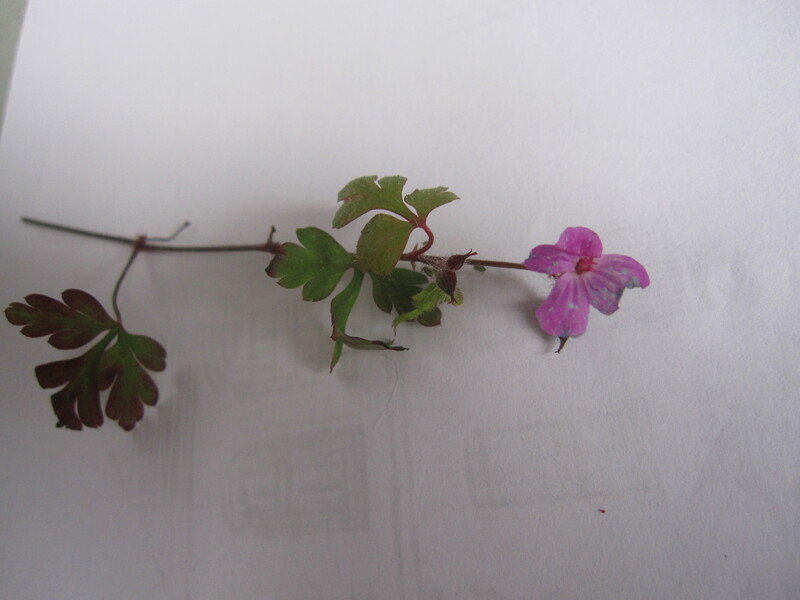 I was looking at this photo of one of the Geraniaceae family and trying to think what it is that defines it as a Geranium. 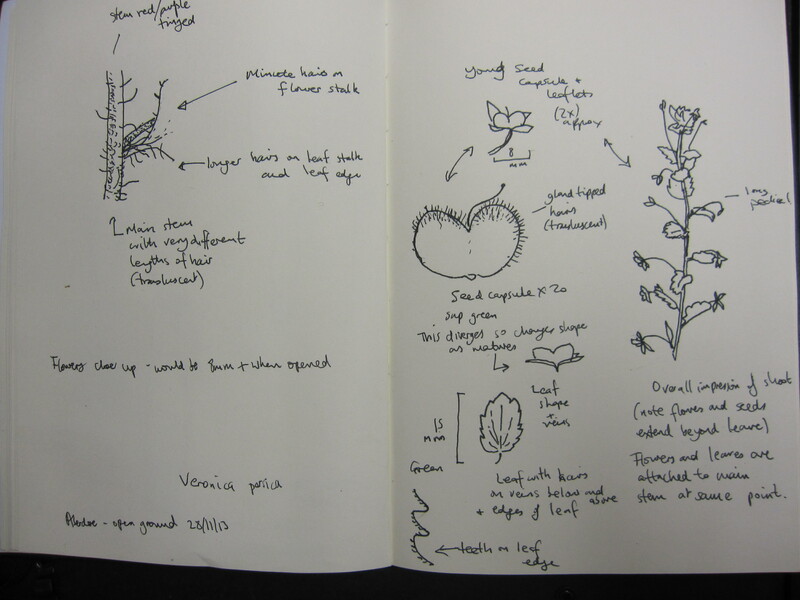 I guess we instinctively know what plants ‘look a bit like’, without having to think about it too much. Perhaps there is a lot of pink going on and the leaves seem to be a bit on the circular side like the garden Geranium(Pelargonium). 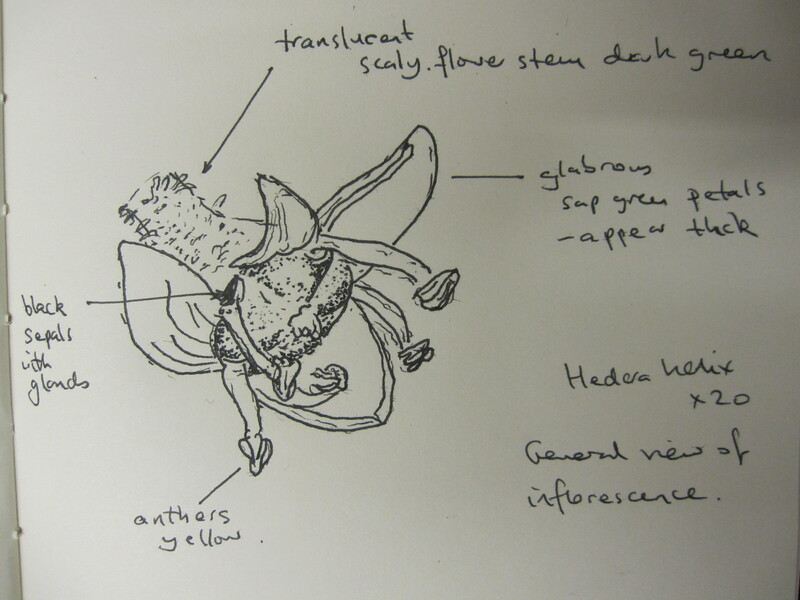 However these characteristics are not accurate enough, as the Geraniaceae can have different coloured petals and different shapes of leaf, so I am left with a fairly indistinct set of features. These include 5 petals, 5 sepals, 5 stigmas, 5 or 10 stamens and leaves that are either pinnate or palmate. The most interesting bit however is the sticky-out long beak which are elongated parts of the ovary that give the 2 British genera their common names, Crane’s Bill(Geranium) and Stork’s Bill (Erodium). 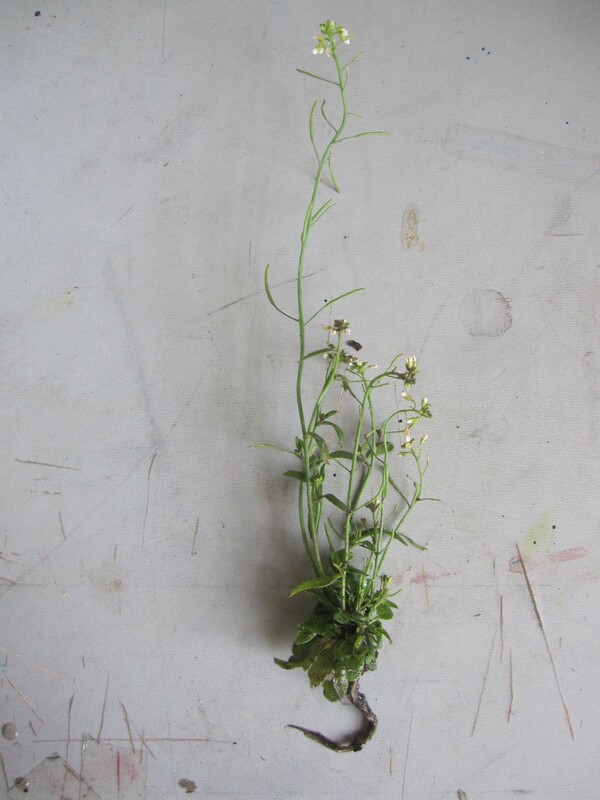 The main problem is that these are not always apparent if the plant is early in its flowering phase. Plant that has just finished flowering with aphids! Seed capsules of Geranium ready to leave but still attached to long beaks. When the seeds are ripe the beaks roll up from the tip (where the stigma was) to eject them. 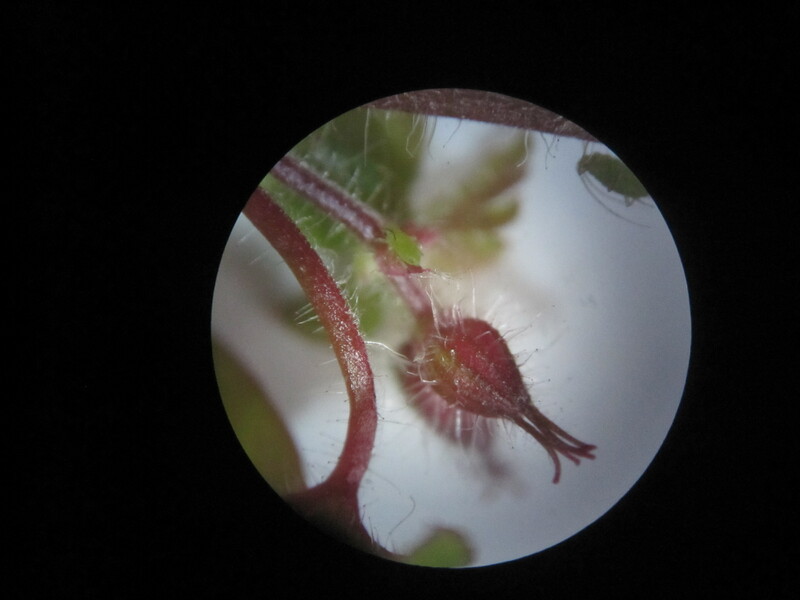 Apparently flowers of the Geranium genus have rolled beaks whereas Erodium have twisted beaks. This plant was suckering from a nearby hedge since the last time the grass verge had been cut. Dogwood Cornus sanguinea belongs to the Cornaceae family, with opposite leaves and small 4 petalled flowers in umbels. The leaves tend to turn from green to red in the autumn, and the main veins of each leaf tend to curve back towards the tip. Whether or not the leaves are opposite ( 2 leaves attached to the main stem at the same point) or not, is a useful diagnostic feature; especially in winter tree identification. When the leaves fall we are left with a narrow red-tinged stem with small buds that are opposite and pressed closely to the stem. The closely related Red-osier Dogwood Cornus sericea has been widely planted for its winter colour and has bright red stems. There are a surprising number of plants still in flower though they tend to be occasional and not always in the best condition. 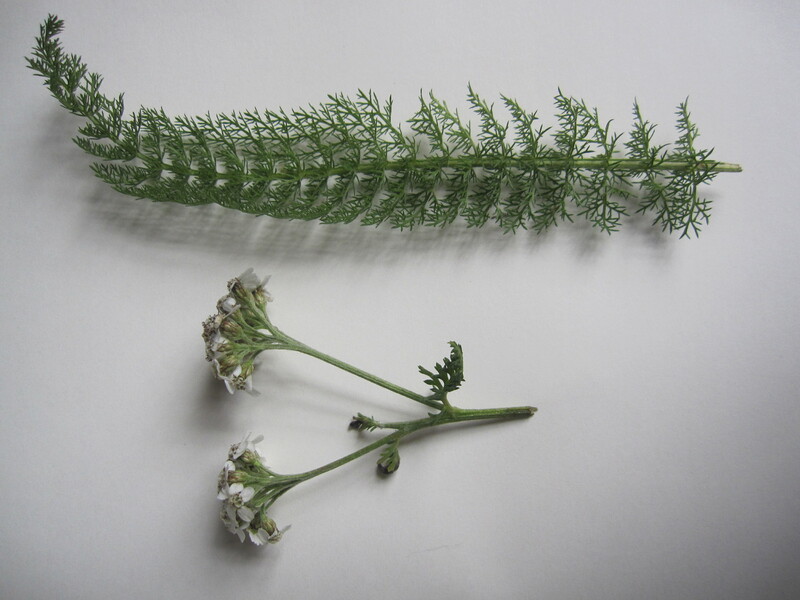 This is Yarrow Achillea millefolium, a common plant of roadsides and rough grasslands. It has very fine feathery leaves and heads of dirty white flowers that could be mistaken for a member of the Umbelliferae family, but it is in fact one of the Asteraceae (formerly Compositae). What appears to be an individual flower in the Asteraceae, is actually a dense collection of small flowers or disc florets. What appear to be the petals around the disc florets are called ray florets. 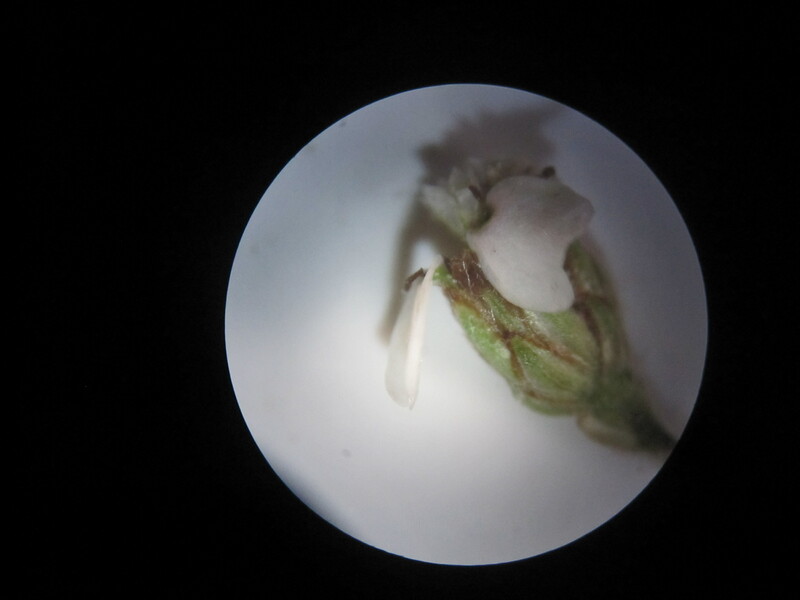 In this photo the large white ray florets are clearly visible but the disc florets are crammed in the centre of the flower head. The large scales that contain the flower head are called involucre-bracts. 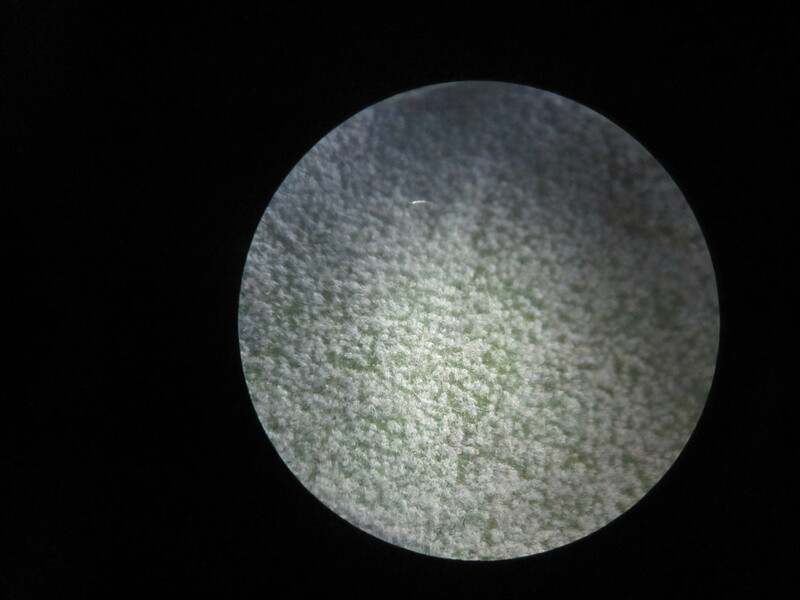 Here is an individual disc floret, on the right is the shape of what will be the fruit or achene. This disc floret is tubular and it did have a small scale attached to it at the base which has been removed for the photograph. Is it a pile carpet? 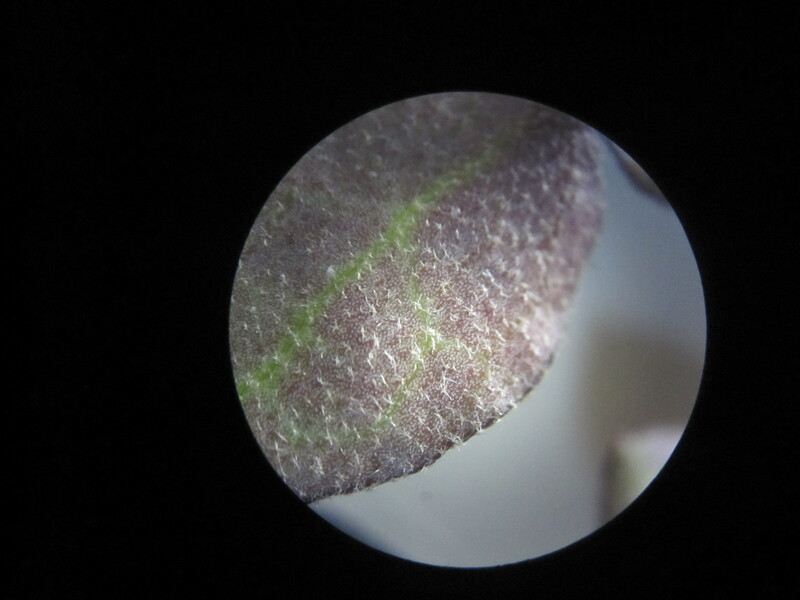 No its the downy underside of a leaf of Q ilex! and is a characteristic of other evergreen oaks such as Cork Oak and Live Oak. None of these are native to Britain but apparently Q ilex has been getting itself into trouble by self setting and ‘invading’ grassland, and is increasingly being seen as an invasive non native species. 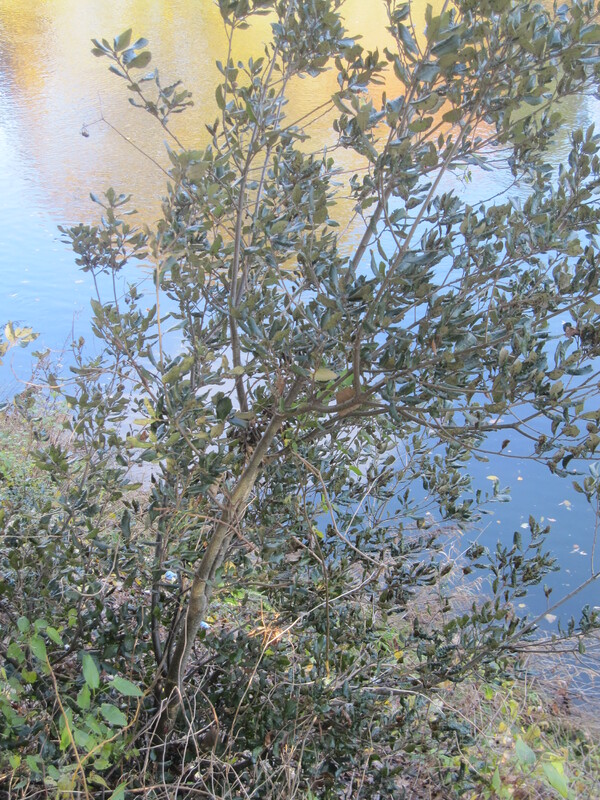 To the casual observer, Q ilex is often confused for Holly Ilex aquifolium, due to both its evergreen nature and the fact that it has variable leaves which may also have short spines. Q ilex however has the distinctive downy undersides of the leaves whereas I aquifolium is glabrous (without hairs) throughout. Another plant that flowers at this time of year is Ivy Hedera helix making it a valuable source of late pollen for a range of insects. 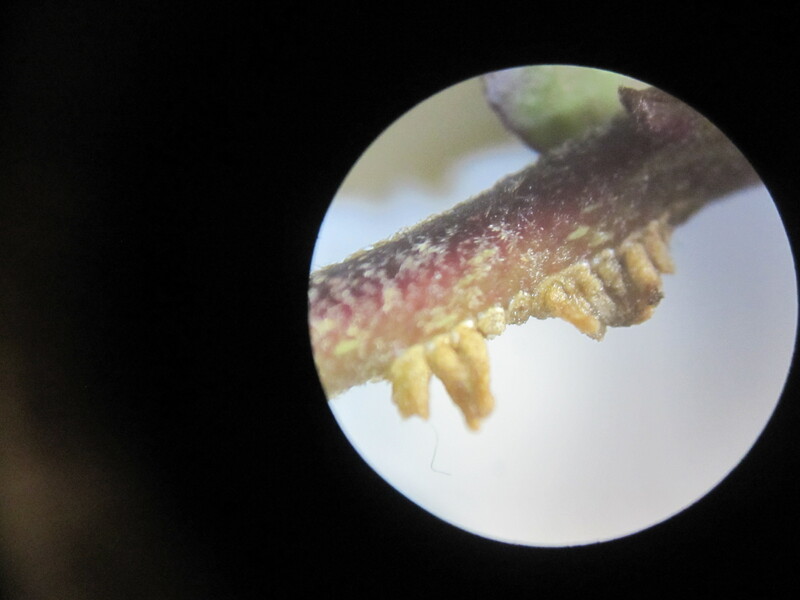 The Stace (1997) key uses hairs on the young leaves and stems as diagnostic features, and I was quite surprised to see how beautiful these star shaped (stellate) hairs are. H helix is categorised into 2 common sub species in Britain, ssp helix with whitish hairs and ssp hibernica with yellowish brown hairs. This looks like H helix ssp helix to me, which I think is the more widespread one. The flowers are borne in umbels and are mainly green with noticeably yellow anthers. 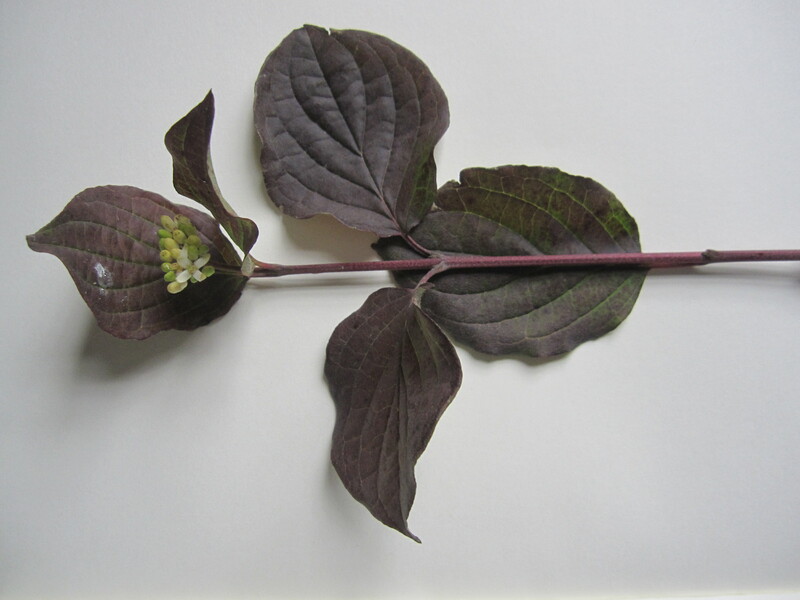 The petals are thick and fleshy while the sepals are black, small and bract like. H helix is the only native representative of the Araliaceae family in Britain. This last photo shows the sucker like roots on a young shoot which presumably make this plant such an effective climber over walls and trees. At this time of year there are relatively few plants still in flower, but this is one of them. Ivy leaved toadflax (Cymbalaria muralis) still has the occasional flower but they have to be searched out. As discussed earlier it even has its own wall community. This view shows the lower corolla lip (the upper part of the corolla has been removed)with 2 white and yellow swellings called the palate. 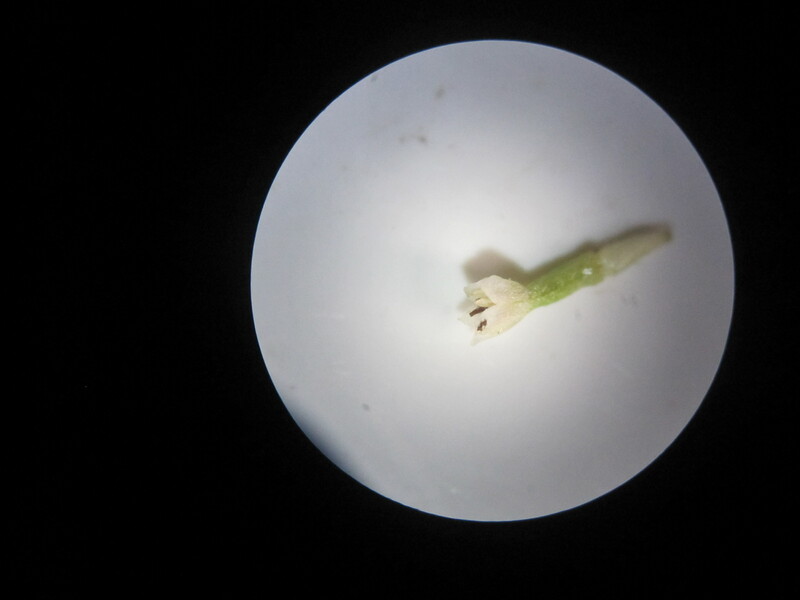 Also visible are 3 of the 4 stamens which are attached to the corolla tube. C muralis is one of the figwort family or Scrophulariaceae. This family are characterised by their zygomorphic (having only one plane of symmetry) flowers, although they are not the only family to do so (see for example the Labiate family). 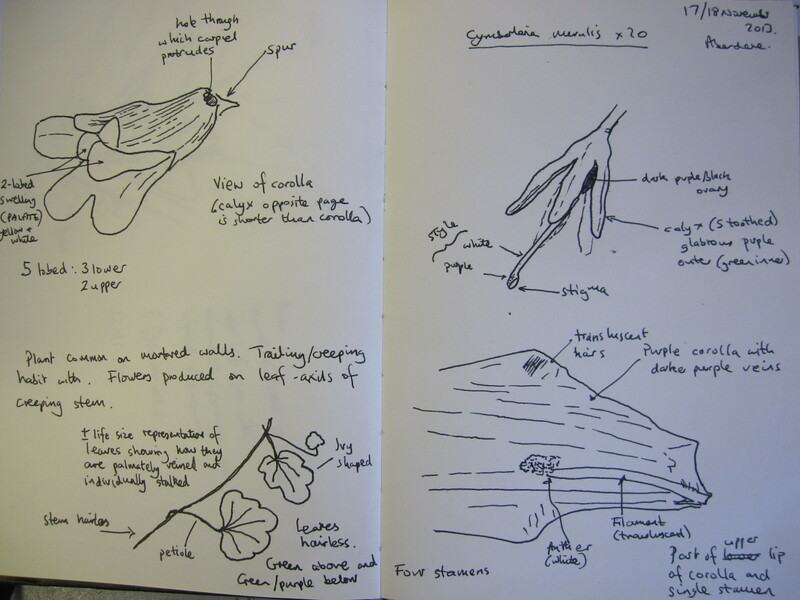 The notebook sketches show more of the diagnostic features of this species. This includes from top left, the five lobed corolla with swollen palate and spur. Top right shows the calyx which is shorter than the corolla and has just one stigma. 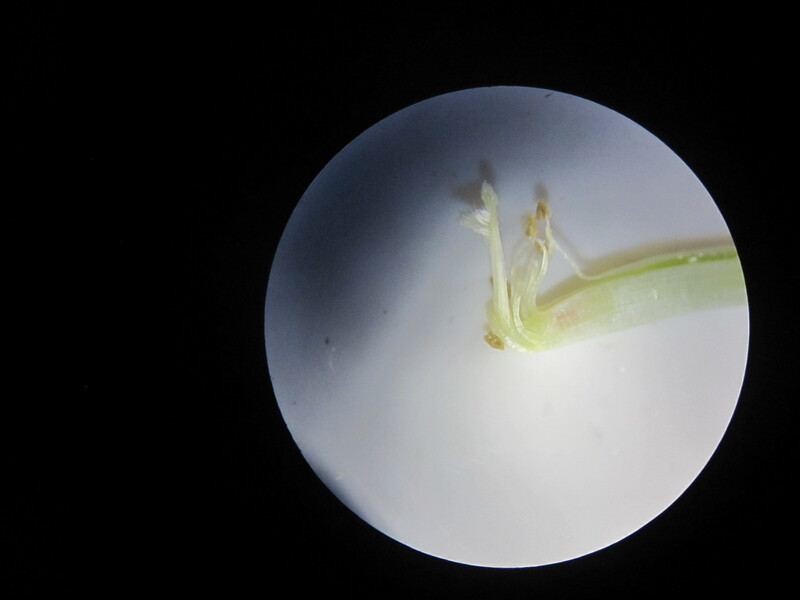 Bottom right is the upper lip of the corolla shown from the inside with one stamen still attached near its base. Note the fine translucent hairs, midway to the edge of the corolla. 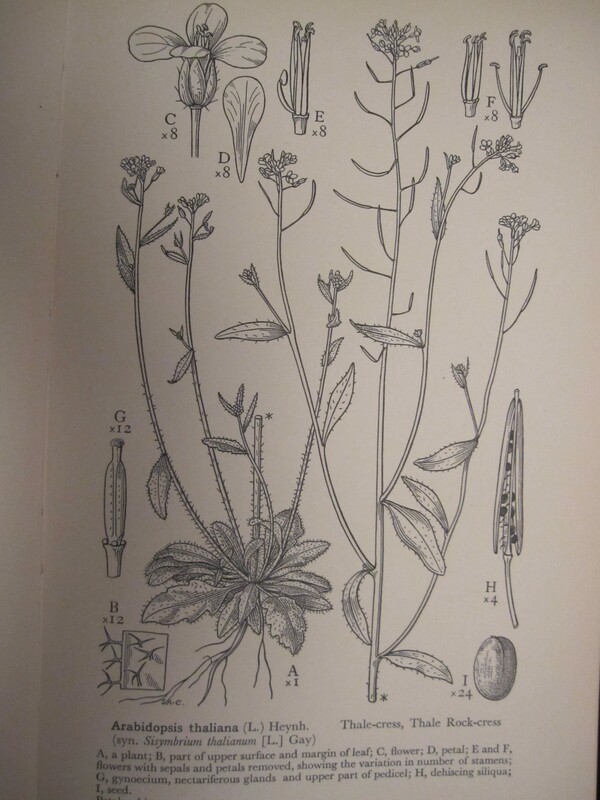 Bottom left is a sketch of the creeping nature of the plant, with long stalked ivy like leaves attached at various points to the main stem. The junction of the main stem and leaf stalk (petiole) is also where the long stalked flowers may be attached.